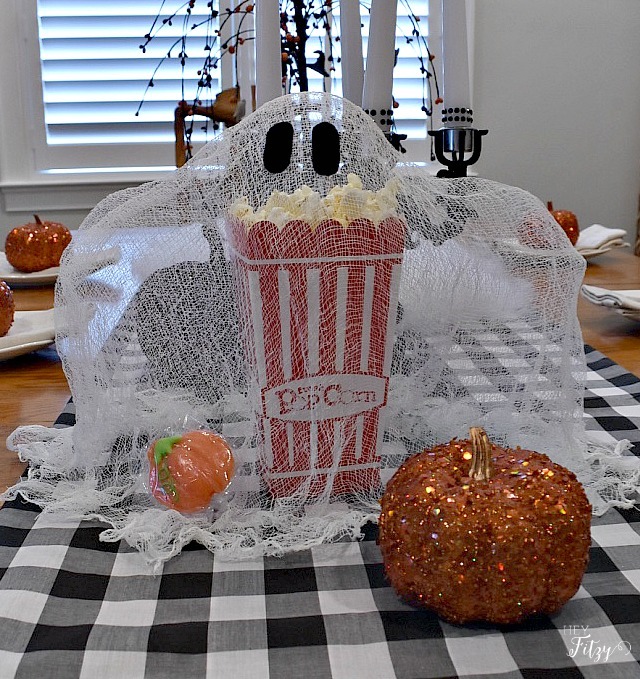 Today I am linking up with a great group of bloggers for a fun popcorn box party. Hosted by Laura Kelly at Me and My Inklings, each participant was sent a popcorn box and some crafting supplies. We were asked to be creative and come up with something fun for Halloween. It didn’t take me long to know that I wanted to make a cheese cloth ghost. They are so fun and easy to make. I started making these cheese cloth ghosts several years ago. They are so easy to make that I can whip one up in no time now. 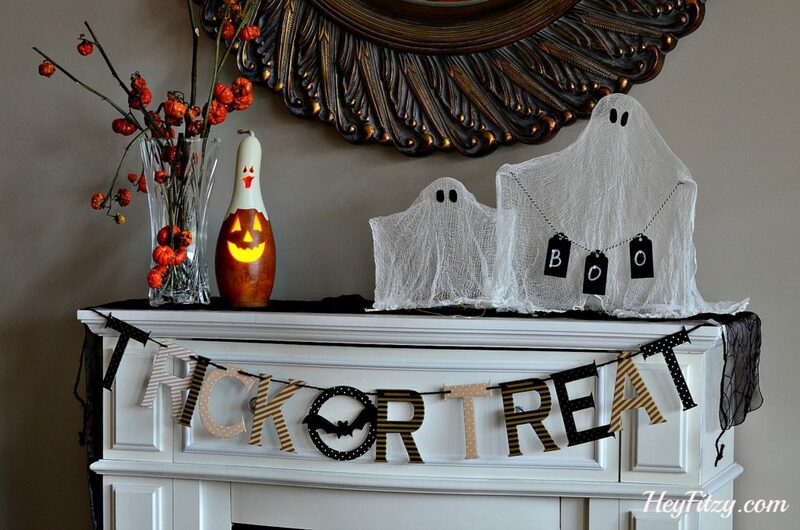 It is fun to change the size and decorations to create a new and different ghost each time. 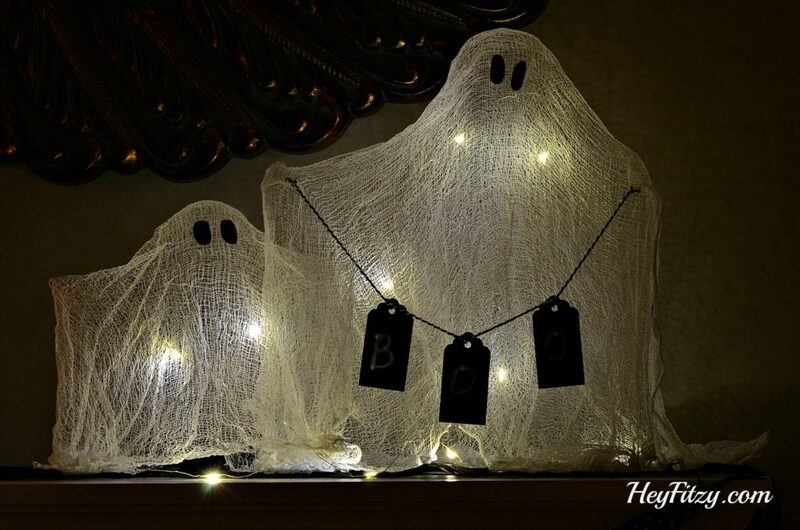 These cheese cloth ghosts also make a fun hostess or teacher gift. 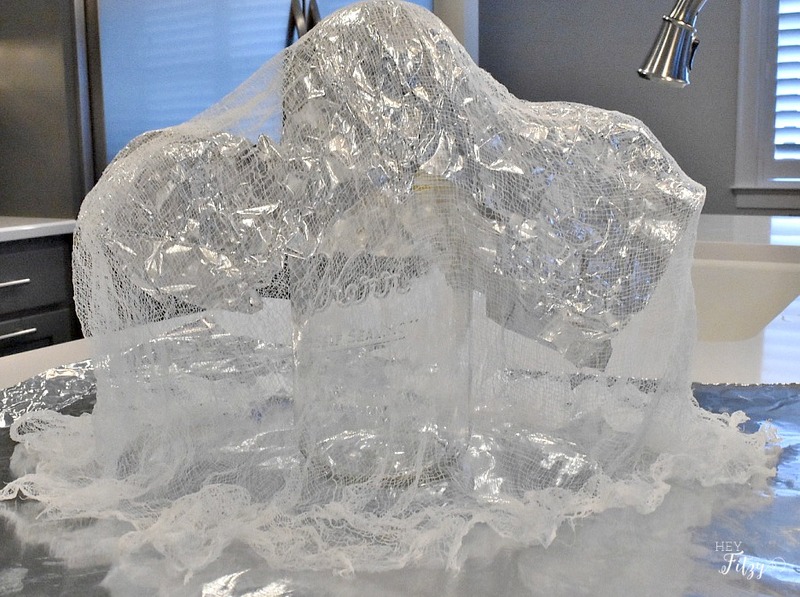 What you need to make a cheese cloth ghost. Probably one of my favorite things about these ghosts is that the kids can get involved. They can help determine the size and overall shape of the ghost. For this one, I used a mason jar and a kiddy ball. Some times I will use a milk jug or something larger to make a larger ghost. I like to use tin foil to form my ghost. 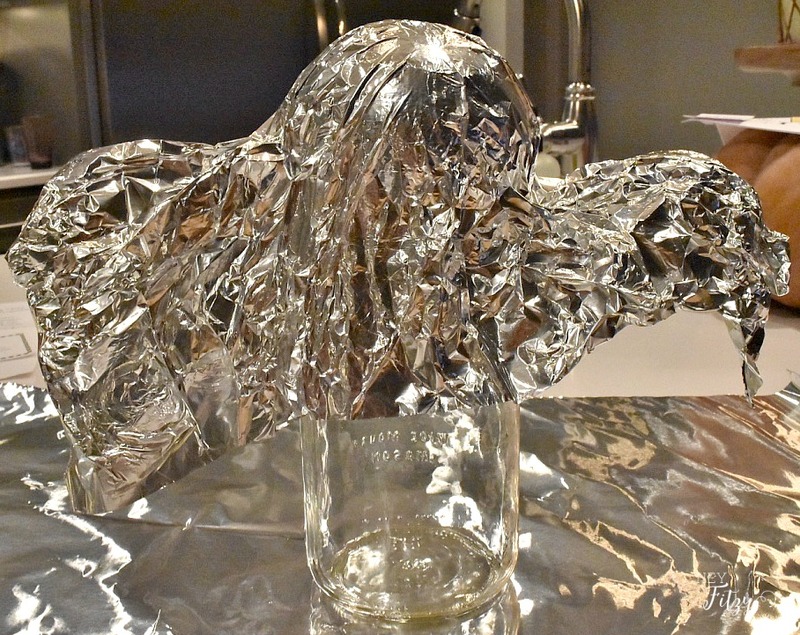 The cheese cloth is so light the tin foil will hold its shape. 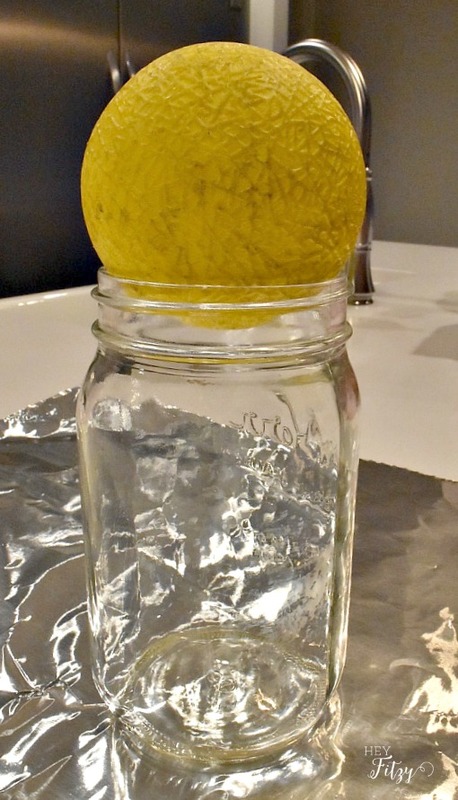 Plus, the tin foil protects the surface of your ball, jar, and counters from the starch. I pour the liquid starch in a small bowl. After you determine the size of your cheese cloth, simply put the cheese cloth directly in the bowl of starch. Make sure it is completely covered in the starch. Next you can ring out the excess starch with your hands by squeezing the cheese cloth. Next drape the cheese cloth over your form. Remember how you drape your cheese cloth is the way the ghost will form. Take the extra time to drape and fluff your ghost as desired. I like to let my ghost dry overnight. By morning you can gently un-peel your ghost from the form. Add little felt eyes and any other embellishments you desire. 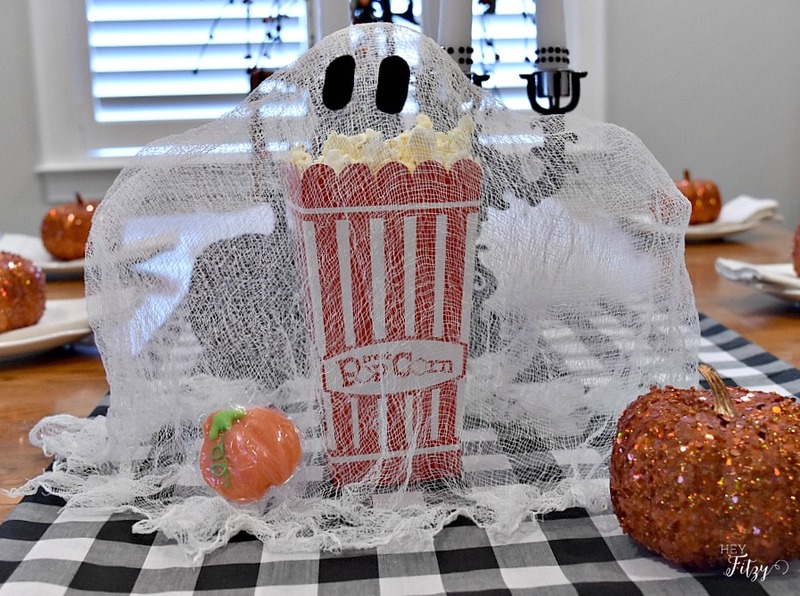 For this popcorn box party, I decided to make my ghost large enough to drape over the popcorn box. It makes a cute addition to my halloween table. Here is a picture of my halloween ghosts from a few years back. And look what happens when you add lights. So fun! 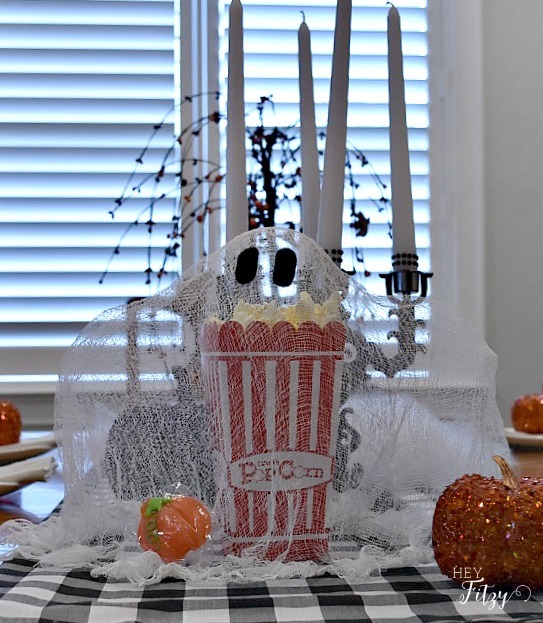 Now go check out all the fun popcorn boxes create for Halloween. Hi Lynn, I am slowly accumulating a small family of these cheesecloth ghosts. I am constantly making new ones in different sizes with different decor. The kids love to make them with me so that adds to the fun!